​​​​​ THE COLONY - The development group behind Grandscape — a $1.5 billion mixed-use development anchored by the massive Nebraska Furniture Mart — has started construction on its next phase of the 400-acre project, a $45 million "boardwalk" district. 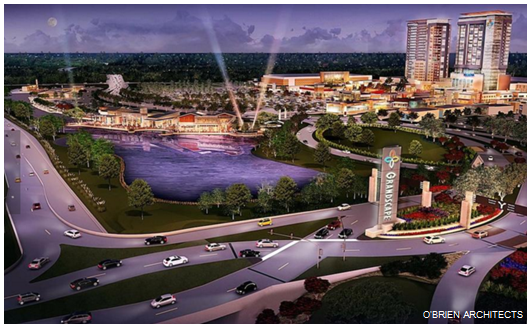 The boardwalk at Grandscape will include a restaurant row overlooking a man-made lake fronting the Sam Rayburn Tollway. Once filled, the 11-acre man-made lake fronting the boardwalk will bring an amenity to Grandscape, which has already landed a number of restaurants and 1,800-fan concert venue. Recently, the Warren Buffett-backed company landed the 1,800-seat concert venue Lava Cantina along the boardwalk and could land another five restaurants. Two new restaurants — Dog Haus and Bread Zeppelin — are the first to join the buildings that would total more than 16,000 sf in retail space. Both restaurants are slated to open in fall 2016. Along with the boardwalk district, Grandscape has started construction on two multitenant buildings along Plano Parkway in between Bargain Way and Nebraska Furniture Mart Dr.